Have similar figures? 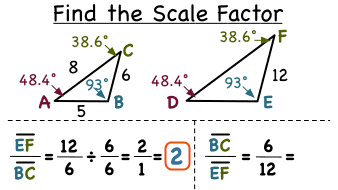 Want to find the scale factor? Then check out this tutorial! You'll see how to use measurements from similar figures to create a ratio and find the scale factor. You can't learn everything about math without dealing with triangles. Did you know that there are different types of triangles? Check out this tutorial, and learn about triangles and their different types! Looking at similar figures? Want to find a missing measurement on one of the figures? You could use a scale factor to solve! In this tutorial, learn how to create a ratio of corresponding sides with known length and use the ratio to find the scale factor. Then, write an equation using the scale factor to find your missing measurement!